We felt a bit like kids leaving home for the first time as we struck out on our own. Our first destination was the beautiful Butchart Gardens in Brentwood Bay. We locked up the bikes and lumbered our panniers into a locker. What to do with our gear when we stop is an ongoing question. We spent a couple of hours at the gardens and they were well worth the visit. This was the glorious sight that met us as we whizzed down the hill to the Butchart Gardens. We left the gardens with a deadline to reach the ferry across to Mill Bay. The plan was to buy dinner supplies for the evening before we got on the ferry because there are no shops at Bamberton Park, our campground. We figured that where the ferry was, the shops would be also. Wrong! The ferry was was at the bottom of a very long hill, the shops were at the top. We tore up the hill, I guarded the bikes and Grieg did a whirlwind shop before we roared off back down the hill and onto the ferry. Bamberton Park was an uphill grind but we arrived with loads of time before sunset to get ourselves organised. Sunset is about 9.45 pm. The geezer in charge sold us rookies wet wood. Took forever to get this going. Where there’s smoke there’s fire…eventually. Our first night on the road was great…dinner was delicious, the tent stayed up and no bears visited. Next day we headed for Cowichan Bay which has a ‘slow food’ policy and fast food stores are banned. ‘Slow’ seems to have extended to their start time too, but the main thing was that the amazing bakery was open and we had the best raspberry Danish ever created. They also had a quote up in the shop from HG Wells that read ‘Whenever I see an adult on a bike, I no longer despair for the human race.’ We liked that! The most divine raspberry Danish. From Cowichan Bay we rode through lovely countryside with berries everywhere, roadside stalls as well as roadside bushes. Blueberries, raspberries, blackberries, strawberries, as well as the more unusual – to us at least – thimble berries, salmon berries, tayberries and wild black currants. We’ve eaten LOADS of berries! We also picked up some eggs, ham and cheese from a roadside smokehouse. I know, completely impractical since we have no refrigeration and we’re bouncing along back roads, but sometimes impractical works out just fine. 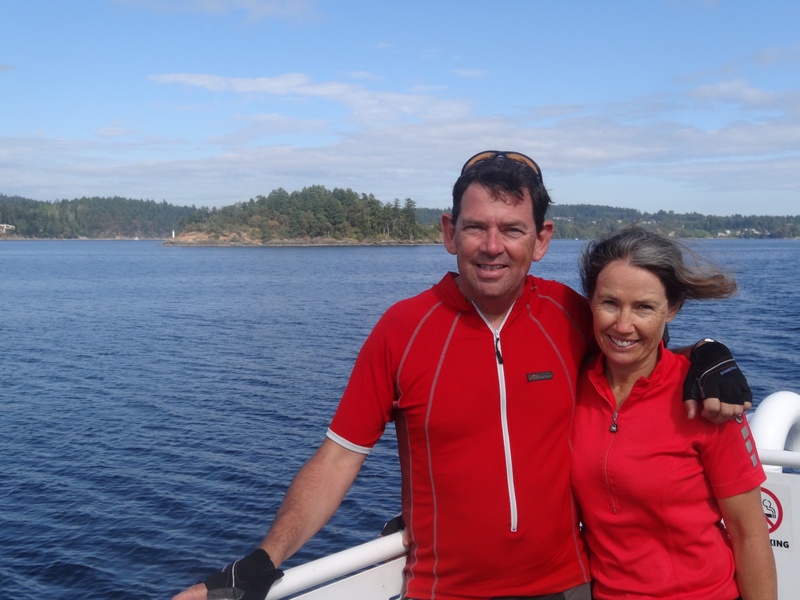 We rode on to Crofton where we caught the ferry over to Saltspring Island, more beautiful ocean, hills and rivers to enjoy. On the ferry a friendly guy came up to us and asked about our bikes. We got chatting with him and his wife – Alex and Juliette – and they suggested that we may like to camp in the meadow alongside their cabin. No firm plans were made but it seemed like a good idea to us. Once we reached the island we ground our way up the hill – it seems that ALL ferry terminals are at the bottom of gigantic hills – and on to the very lovely and inappropriately named town of Ganges. From here we followed Juliette’s directions to ‘Galilee’, up, up and more up. The muscles are developing! It was a hot day and after setting up camp we continued on the end of the road for a swim at Beddis Beach. Alex and Juliette warned us that it would be freezing and it WAS! We took their advice and rode to Cusheon lake which was much warmer. The day finished with a superb BBQ flung together by us all. Ahhhh, just the ticket after a very hot and hilly ride. Next morning we broke camp early to catch the first ferry from Vesuvius Bay back to Crofton where we stopped for coffee and for me to update the diary. Two older fellows were chatting together nearby. One of them turned to me and drawled, ‘har carme you’ve gart arll thart load an he jist gets the traailerrr?’ Grieg was rather bemused and before he could defend himself the other fellow said, ‘ohh no, he’s gart all thart extra rroad carntact…put thart in y diary!’ We left chuckling and headed for Nanaimo. Hey Jules. I am really enjoying reading about all of your adventures! You are doing great blog job. All systems go here in prep for MTB weekend racing. Rowan off to Paris tonight. Kelsie driving us nuts re: dress for uni ball. Found a dog causing traffic jam amongst the school mums today, hoiked Groova into the car and left message for owner who picked him up a bit later. Went for Tuesday group ride, got rained on and so cold could barely hold my drink at coffee shop! Otherwise life pretty much as normal. Bye for now. J.B.